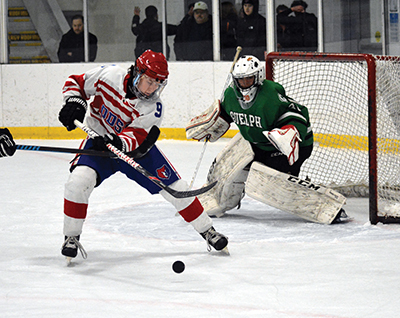 It didn’t take the Orangeville District Secondary School Bears boys hockey team very long to set the tone of the game in their quarter-final match against Guelph Collegiate Vocational Institute at Tony Rose arena on Friday, February 16. At the end of the first period the Bears were leading 4-0. After that big opening they let up in the second scoring no goals and allowing the Guelph team to get one on the scoreboard. The second period saw lots of end to end play with the Guelph team putting in an effort to get back into the game. Returning for the final period the Bears again put on the pressure to end the game and scored four more to leave the ice with an 8-1 win. The Bears will now advance to the semi-final round. Bears goals came from Owen Buckley, Jake Quinlan, Andrew Whitton, Kyle Waters for two, and Dakota Zarudny who got a hattrick for the game. The semi-final round got underway this week with results not available at press time. The Bears face Erin District High School in that round. Bishop Macdonnel knocked out Norwell District Secondary School in thier quarter-final. Centre Wellington dispatched Centennial Collegiate in thier quarter-final game. The winners of the two semi-final games will meet for the District 4/10 championship game on Tuesday, February 27. The location for the championship game has not yet been determined.